Happy 2017, everyone! Where has the time gone?!? I hope the holidays were kind to you all. Evan and I had a lovely Thanksgiving with his family in NH with a whopper of a bird – 34 pounds! It barely fit into Evan’s mother’s commercial size oven. We continued our tradition of going our separate ways for Christmas, but reunited back in Chicago for NYE. Instead of hosting the usual gathering of friends at our place, we decided to venture out this year on a shoreline cruise, a roaring 20’s themed party, “The Great Libation“, thrown by a friend of ours. It was an epic night filled with never-ending glasses of champagne and a sky full of fireworks over Lake Michigan at midnight. Now it’s time to get back on track! I’ve been busy with life, but have found that I miss blogging. Sometimes we all need to reevaluate how we spend our time. I love cooking, but I have to admit, there are weeks that it feels like a dreaded chore. I’m sure you all know how it goes – work, travel, exercise, never-ending housework, spending much-needed quality time with family and friends. The list goes on and on… That being said, I’m going to try to post at least once a month, twice if I can. This seems like an achievable goal. Are you ready? I sure am! 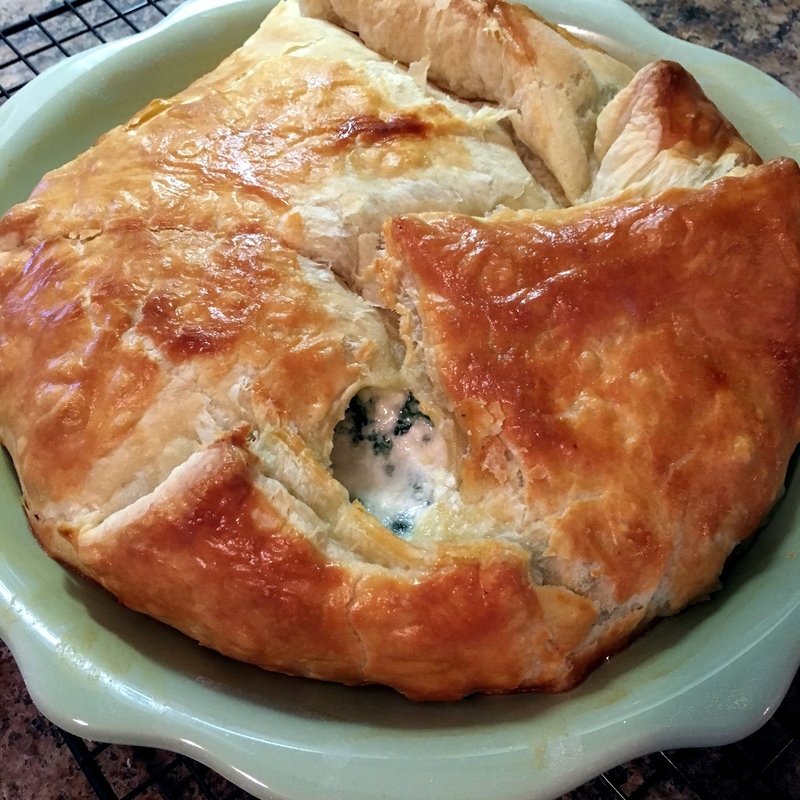 I made this spinach pie for brunch this past weekend, but you could really eat it any time of the day. A couple days after we ate this—with a side of bacon—in the morning, we had it as a side dish with some leftover chicken parmesan Evan had made. You could also enjoy it at lunchtime to get some delicious greens! 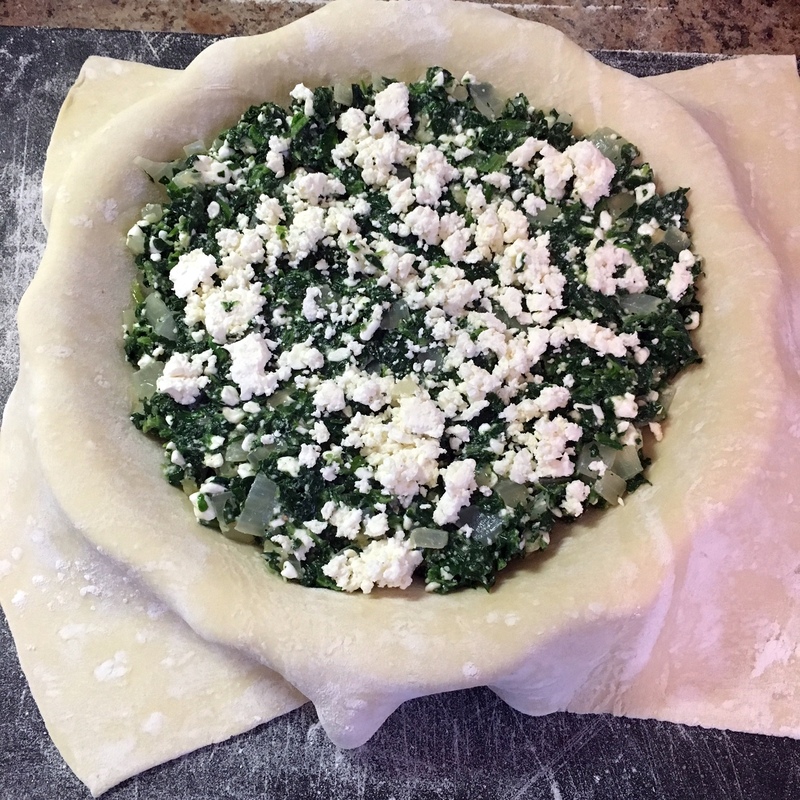 To make your own, you will need olive oil, onion, garlic, cottage cheese, parmesan cheese, ground nutmeg, sea salt, fresh ground pepper, eggs, frozen chopped spinach (thawed), feta cheese, puff pastry (thawed), and flour for dusting. Preheat the oven to 375 degrees. Heat a skillet over medium-high heat. While your pan is heating, dice one small yellow onion and mince 3 cloves garlic. Add them to your pan along with a tablespoon olive oil. 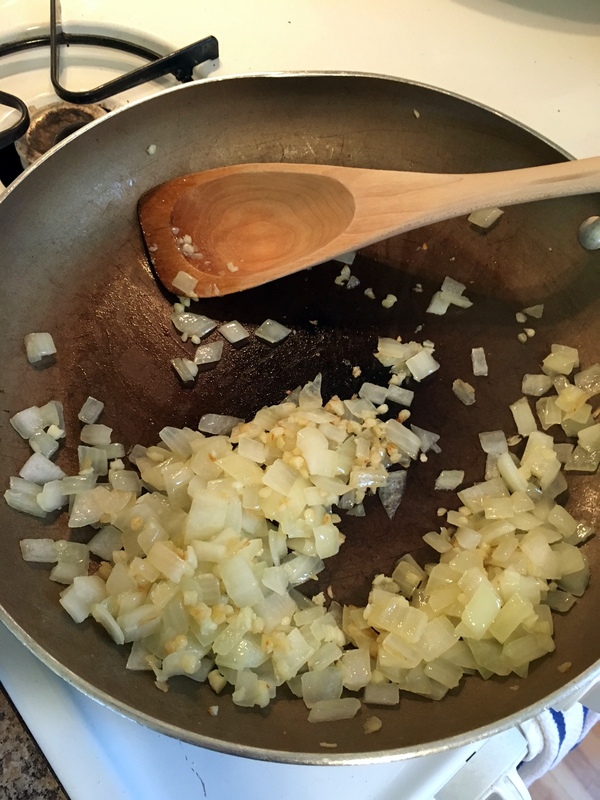 Sauté until the onions are soft and translucent. 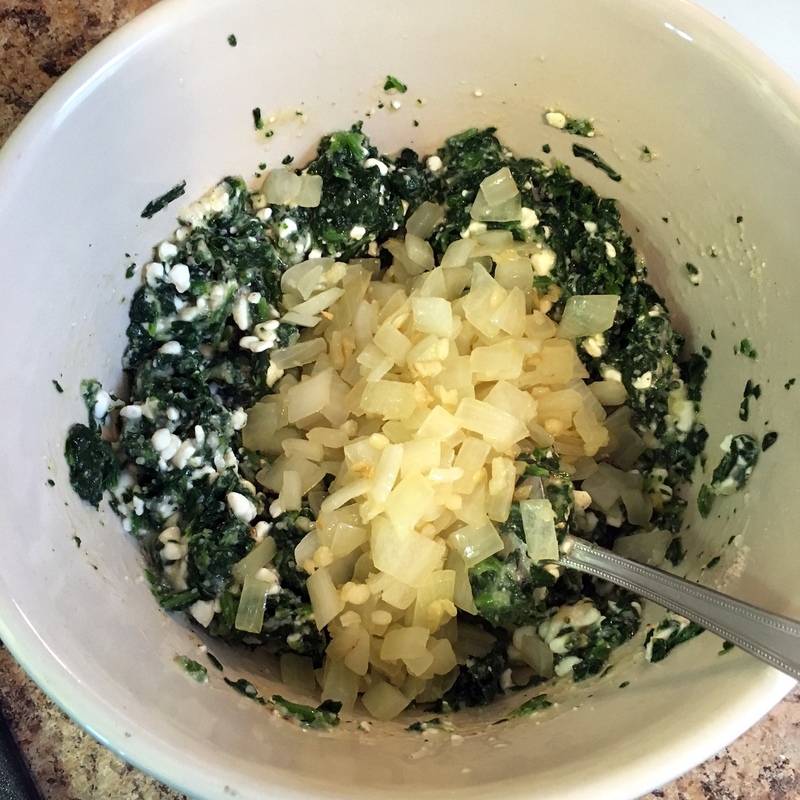 While the onion and garlic are cooking, add 16 ounces thawed frozen chopped spinach to a colander, pressing to remove as much moisture as possible. Add it to a large mixing bowl along with 3/4 cup cottage cheese, 1/4 cup grated parmesan cheese, a dash each of ground nutmeg, sea salt, and freshly ground pepper, and 2 eggs. Stir to combine. When the onions and garlic are cooked, add them to your bowl, stirring to combine again. Lightly flour a work surface. 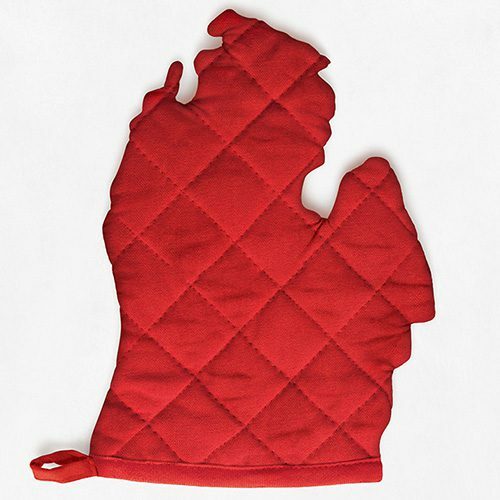 Unfold one thawed puff pastry sheet onto it, using a rolling pin to roll it out to approximately a 14″ x 14″ square. 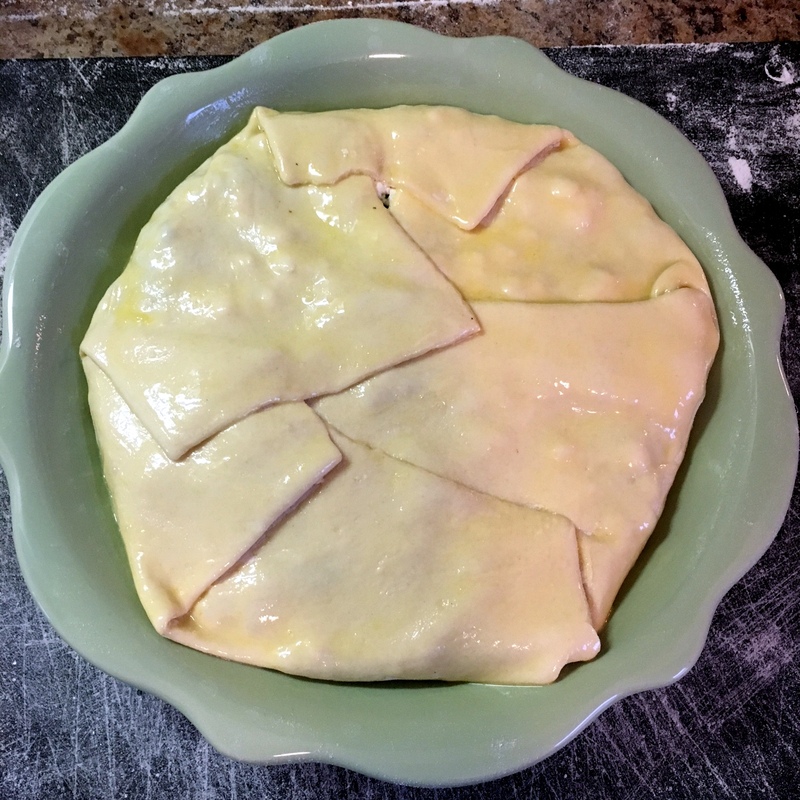 Once you achieve the desired size, gently place the puff pastry sheet over a 9″ pie dish, pressing down carefully so that the pastry takes the shape of your dish. Spoon the spinach filling into the dish. Crumble 1/4 cup feta cheese and sprinkle it over the top of the spinach filling. Whisk one egg in a small dish and brush the top of the pie to give it a nice golden crisp. Bake for 45 minutes, remove from oven and let cool for 10 minutes before serving. Breakfast, brunch, lunch, dinner, or linner (? )…whenever you decide to serve your spinach pie, ENJOY! 1) Preheat the oven to 375 degrees. Heat a skillet over medium-high heat. While your pan is heating, dice one small yellow onion and mince 3 cloves garlic. Add them to your pan along with a tablespoon olive oil. 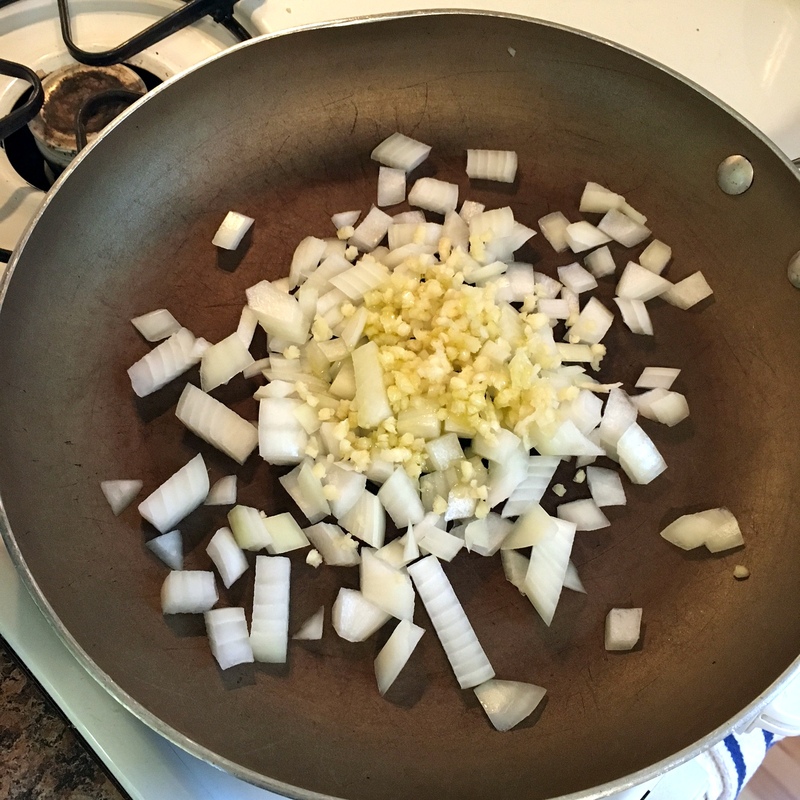 Sauté until the onions are soft and translucent. 2) While the onion and garlic are cooking, add 16 ounces thawed frozen chopped spinach to a colander, pressing to remove as much moisture as possible. 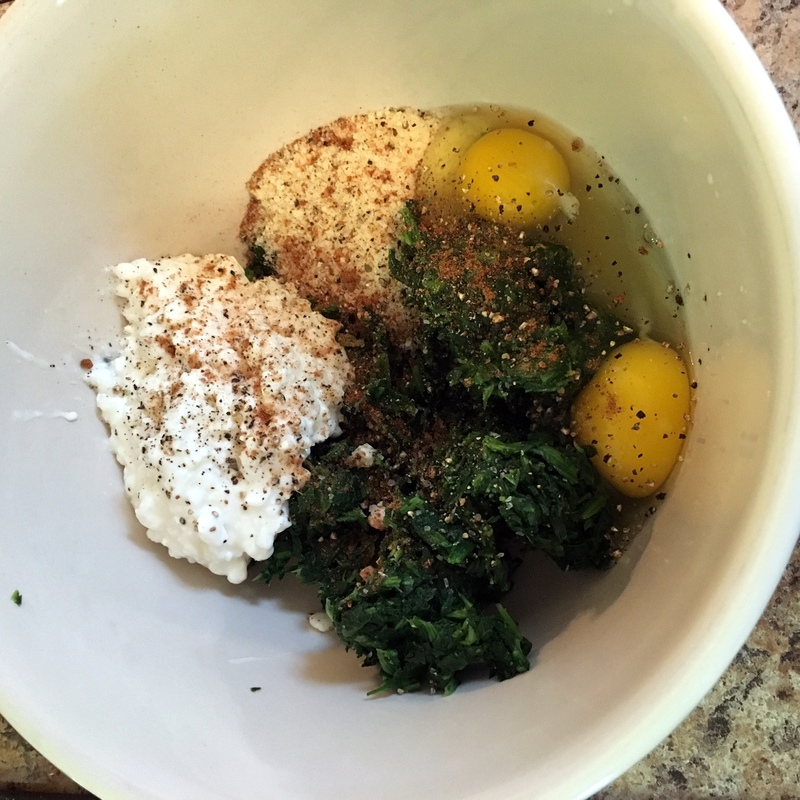 Add it to a large mixing bowl along with 3/4 cup cottage cheese, 1/4 cup grated parmesan cheese, a dash each of ground nutmeg, sea salt, and freshly ground pepper, and 2 eggs. Stir to combine. When the onions and garlic are cooked, add them to your bowl, stirring to combine again. 3) Lightly flour a work surface. 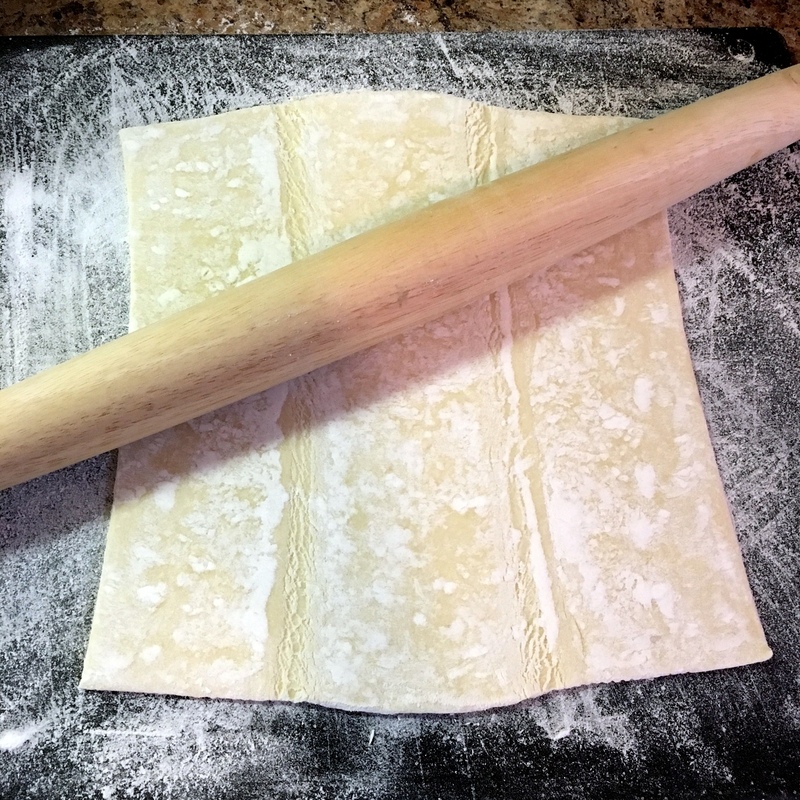 Unfold one thawed puff pastry sheet onto it, using a rolling pin to roll it out to approximately a 14″ x 14″ square. Once you achieve the desired size, gently place the puff pastry sheet over a 9″ pie dish, pressing down carefully so that the pastry takes the shape of your dish. Spoon the spinach filling into the dish. Crumble 1/4 cup feta cheese and sprinkle it over the top of the spinach filling. Fold the pastry draped over the edges up and over the filling. Whisk one egg in a small dish and brush the top of the pie to give it a nice golden crisp. 4) Bake for 45 minutes, remove from oven and let cool for 10 minutes before serving. Enjoy! This is so beautiful I just licked my phone!